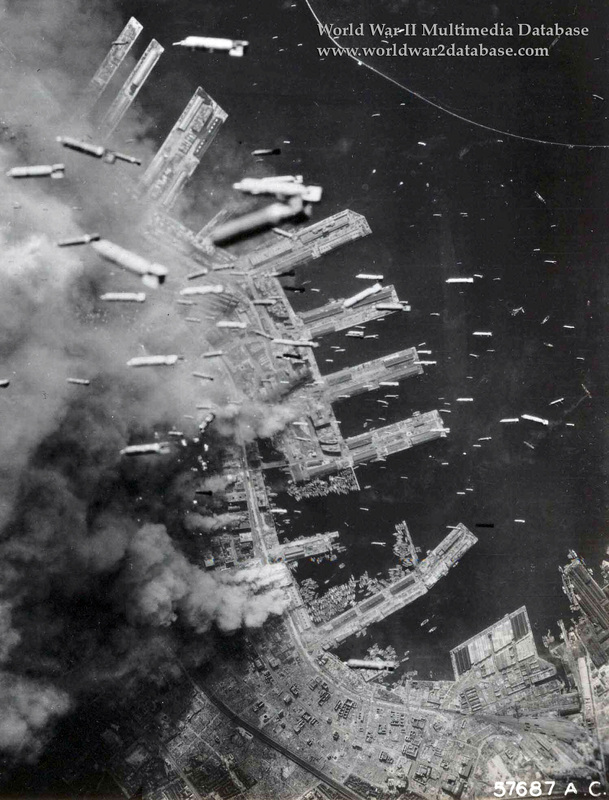 M47 100-pound (45.4-kilogram) incendiaries rain down on the docks of Kobe on June 5, 1945. Some 3,614 Japanese died in the attack, 10, 064 were wounded, and 51,399 buildings were demolished; 4.4 square miles of the city was destroyed. Inclement weather prevented P-51D Mustangs from escorting 473 Superfortresses that completed the bomb run. 150-160 Japanese fighters and endured 647 separate strafing runs. Anti-aircraft artillery was heavy as well. Six B-29s were shot down over the target and 27 were damaged. Many of the planes could not make it all the way back and either ditched or landed at Iwo Jima. Kobe, a cosmopolitan city the size of Baltimore with a pre-war population of nearly one million and an area of fourteen square miles (36.2 square kilometers), was first attacked on March 17. 8,841 of the city's residents were killed. Three square miles were burned out that included 21% of Kobe's urban area. More than 650,000 people had their homes destroyed, and the homes of another million people were damaged. After a third raid, a total of seven square miles (18.3 square kilometers) of Kobe was destroyed. American fliers who were shot down over Kobe were executed the same day.